I recently decided to reread a few books that I have previously enjoyed and see how they held up to the passage of time. While there have been a few selections that didn’t hold my attention the second time around, Piggyback by Tom Pitts not only held up for a second reading, it probable grabbed me even more. When Paul trusts a couple of local girls to make a large delivery of pot for him, he decides to put a little piggyback on the delivery, a shipment of cocaine. This decision comes back to haunt him when the girls disappear from the grid and leave Paul in debt to a dangerous drug dealer. With nowhere else to turn, Paul seeks out Jimmy, a man who can get things done using words or violence. Jimmy and Paul set out on a quest to find the missing goods in order to keep Paul alive. But when the drug dealer decides that Jimmy is on the hook for the missing drugs as well, a mission that started to help a friend, becomes a journey to save his own life. 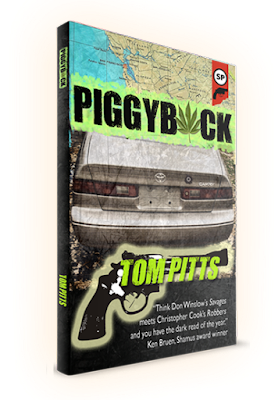 Pitts starts this noirish tale with the pedal to the metal and never lets off the gas. The story ratchets up the tension when Jimmy and Paul locate the boyfriends of the missing girls and leverages their lives for clues to the missing shipment. As the story jumps from narratives, the reader is always looking for a small fix of the narrative they are leaving. I really loved the fact there is not one likable character in the whole mix. At first I thought Jimmy seemed to be a quality guy who was just helping a friend, but as the tale progresses, you see glimpses of Jimmy that prove he is a heartless swine who fits into your classic noir character outline. He isn’t on this quest in the name of friendship; it’s almost as if he is in this quest for the thrill of the action and is willing to hurt everyone and anyone who gets in his way. Pitts has a great knack for locating the people within the underbelly of society and giving them a voice. The characters become alive with motivations, dialogue, and an energy you can feel. Many people may prefer to look away from the types of people who live within the world Pitts creates, but Pitts will make his reader take notice of them. This book is a great read and I am really looking forward to Pitts’ upcoming release, Static. As you join me in awaiting his new release, it would be wise to stock up on some of his older releases to satisfy the jones for more Pitts.